To prepare a high quality (immuno)gold conjugate it is important to have particles with uniform size and highly adsorptive surfaces. The Aurion Gold Nanoparticles – gold sols – are prepared according to unique production protocols. This provides for sol particles with the same narrow size distribution and adsorption properties as employed in the Conventional Immunogold Reagents. The preparation of conventional gold reagents is based on gold particles with a diameter suited for direct electron microscopic visualization. 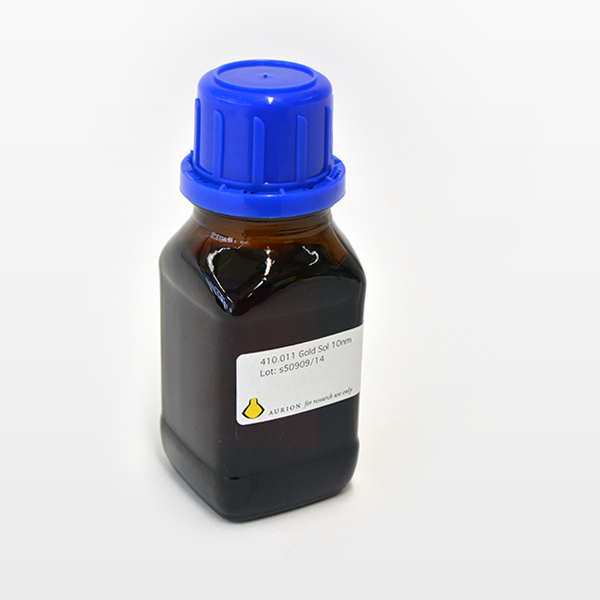 Aurion offers a range of Conventional Immunogold Reagents which cover the majority of approaches in transmission and scanning electron microscopy. Aurion Gold Nanoparticles – Gold Sols – (solutions of high quality unconjugated gold particles) provide opportunities for users to prepare conjugates with primary antibodies, ligands and other binding agents with the same particle characteristics as in the Conventional Immunogold Reagents. Gold Sols are prepared according to a unique protocol, warranting narrow size distribution and reproducible adsorption characteristics. The gold sols are available in the same size range as the Conventional Immunogold Reagents: 6, 10, 15 and 25 nm. The particle population is monodisperse and thus shows minimal size variation and overlap. Typically, the coefficient of variance for the 6 and 25 nm particle size sols is less than 12%, whereas the 10 and 15 nm size sols show less then 10% variation. Actual lot specifications (size, variation and expiry date) are indicated on the accompanying package insert. Package size: 100 ml of high quality gold sol at an OD520nm of approximately 1. Gold sols have a guaranteed shelf life of 12 months from the date of quality control analysis. The products should be stored at 4-8°C. Detailed instructions for conjugate preparation and evaluation are provided in the package inserts.